When I was a teenager I used to go and watch them set up the bleachers and lay down the red carpet for the Academy Awards. It was easy then. 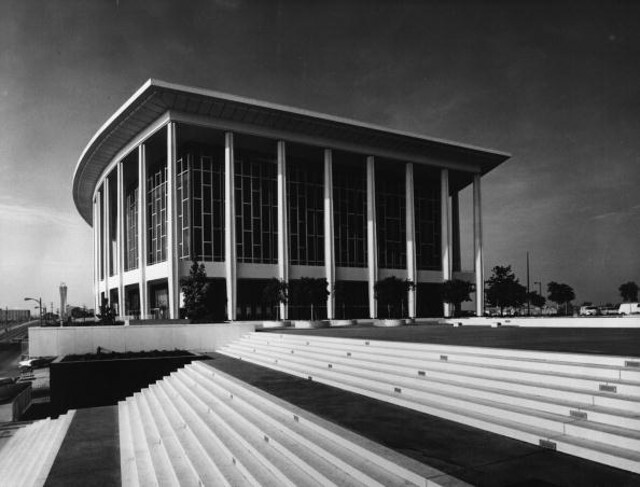 They were held at the Dorothy Chandler Pavilion, smack dab in the middle of downtown Los Angeles and just a short bus ride from my Boyle Heights home. There weren’t many people around. The bleachers could accommodate a couple of hundred people and you could get a space by just hanging around. I have always been a fan. Music, movies, comedy. But I am also a fan of writers and painters, poets and scientists. We needn’t subsist on a diet of strictly sports stars and pop stars. Arts & Letters and the Sciences are all great places to bestow celebrity. The media doesn’t make celebrities, we do. It is in our collective hands, each and every day. I think celebrity should be based on accomplishment, so who deserves it and who gets it are often at odds for me. Once achieved however, there are myriad ways of dealing with it and therein the spectacle unfolds. Some years ago, my wife and I were invited to dinner at a new Japanese restaurant in Hollywood that was currently the rage. It was one of those places favored by celebrities but the food was well regarded so we overlooked the potential distraction. The dinner was pleasant and the meal was tasty. As we were leaving the maître d’ asked us to give our parking ticket to the attendant in order that he might retrieve our vehicle and because it was night time and a bit chilly he suggested we wait inside. As we stood in the doorway waiting for our car I noticed that we were standing across from a woman and her daughter, also waiting for their car. I looked her in the eye in order to make that visual contact that people do who are momentarily confined in close quarters. It is an instinctive formality that we often do without noticing. As soon as our eyes met I realized I was standing in a doorway with Madonna and we were both waiting for our cars. After the initial eye contact she continued interacting with her daughter. She spoke to her not in a loud or commanding voice but in calm and reassuring tones. Her daughter Lourdes was probably about five years old at the time and I remember Madonna holding her close. It was easy to see they had a warm and loving relationship. As she continued speaking I began to eavesdrop. I couldn’t help myself. The conversation had taken a strange and fascinating turn and I was transfixed. She was telling her daughter about a group of “bunnies” that would soon emerge as soon as they left the restaurant. She asked her not to be afraid and reminded her that the bunnies would not hurt her. About this time I was wondering if I myself had indeed slipped down the bunny hole or perhaps I should have asked the waiter what she had for dinner so that I could order some next time. Arriving had been a matter of simple efficiency for us. We alighted our vehicle, gave the parking attendant our keys and entered the restaurant. I did not notice rabbits or mammals of any kind outside of the establishment. Both of our cars arrived at roughly the same time with hers ahead of ours in the queue. As they exited the restaurant and made their way to their vehicle it all made sense. All of a sudden, from out of the shadows and behind bushes and trees, a gaggle of men with cameras emerged like a hundred demented Weegees who had lost their way in history and were now forced to photograph pop stars in perpetuity like zombies with cameras. The “bunnies” were photographers and the flash of light bulbs was unlike anything I had ever seen. In the time it took Madonna and her daughter to go from the door of the restaurant to the vehicle (a distance of approximately thirty feet) there must have been several hundred flashes. For a few seconds the front of the restaurant was lit up like a sidewalk in Las Vegas or the intersection at Times Square on New Year’s Eve. The collective illumination was so bright that I had to look down as I walked. I remember that every crack in the sidewalk stood out and cast a harsh shadow of itself, if only for a split second. The cars and buildings and trees looked like a crime scene photograph, lit brightly for an instant in the night. Then it was over as quickly as it had begun. Before I could make sense of what had just occurred, it was finished. The photographers crept back into the night and disappeared. The spectacle was complete. The night of the flash-happy bunnies was odd but it also triggered a half-memory of something I had experienced before, where one is told, in a childlike way, what is about to happen, how to prepare for it and what to expect. But what was it? Finally it came to me. It reminded me of a marvelous star-studded evening at the Beverly-Hilton Hotel in Beverly Hills, California courtesy of my friend, the brilliant writer, Kim Cooper. 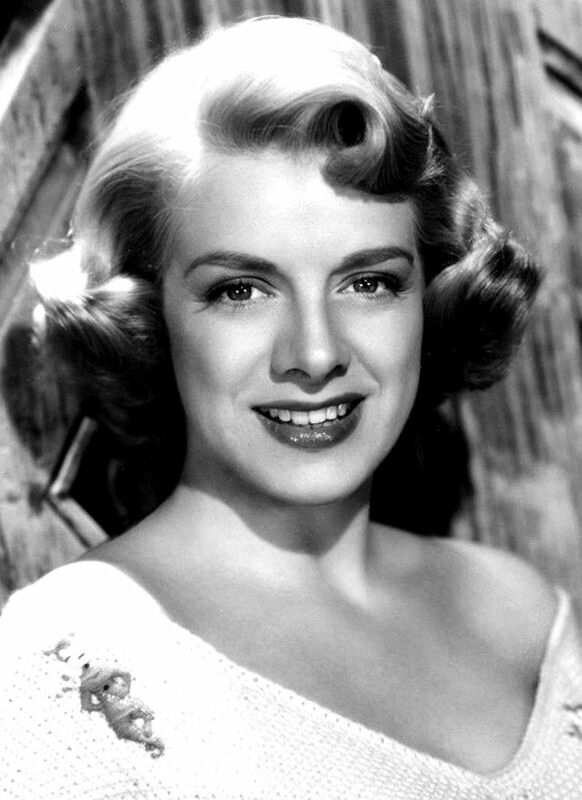 She told me that Rod McKuen, the singer/songwriter and poet, whom she had recently met, had offered her two tickets to a gala benefit in honor of Rosemary Clooney. It was happening that night and it was black-tie. There would be no time to rent a tuxedo. You needed to have one already. Kim went through her phonebook and tried to guess who might have one on hand. Lucky for me, I did. We made our way to the hotel and into the grand ballroom of the Beverly-Hilton. Our table was to the right of the stage and since the “head table” was at the center of the room and the place we were sitting was raised higher than that, it afforded us a great view of both the stage and Ms. Clooney’s table and all the people stopping by to pay their respects. It was a perfect evening. The event was sponsored by the Society of Singers and the award was the Ella, given each year to a singer as a life achievement award. There was no doubt that Ms. Clooney deserved it and that her name alone would attract the kind of talent and the numbers of people needed to raise a significant amount of money for the society. The Society of Singers provides immediate aid to musicians in need and I could think of no better charity to honor Ms. Clooney who had been so blessed throughout her career than the society that helps the less fortunate in the field of entertainment. It was one of those nights I will never forget. Every time a performer got up onstage and sang a song or said a few words I said to myself “I will never forget this moment” and it happened again and again. Sometimes a performer would finish their number and introduce the next one of equal or greater stature. The stories and tributes went on and on and each time I wanted to pinch myself. It was that good and better. Nick Clooney was funny, his son was charming and through it all the audience sat in rapt attention, standing only to provide the standing part of a standing ovation. In this constellation of A-list celebrities from old Hollywood (Patti Page) and new (George Clooney) it would be difficult to pick out the biggest star… but not impossible. 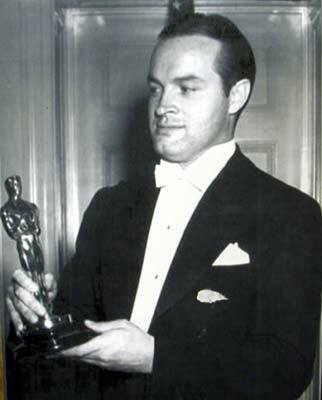 Perhaps owing somewhat to his age, the greatest respect (after the guest of honor) was easily reserved for Bob Hope. Too aged to perform or even to speak at the microphone, he sat at the head table next to Ms. Clooney with his wife Dolores and was lauded every bit as much as Ms. Clooney herself. Representing the Hopes, Dolores took the stage, sang a song and danced a little jig in honor of her dear friend and honoree. The night finally came to an end and we all let out a communal exhale of epic proportions. I had never seen so much talent on one stage in one place before. We said our goodbyes to Mr. McKuen and thanked him for this incredible opportunity. He seemed to enjoy it as much as we did. In the crush of twelve hundred people leaving the hall I became separated from my companion. I decided to wait for her by the main exit as the A-Listers and others emerged onto the red carpet. As a non-celebrity I was invisible, so I took advantage of the opportunity and as soon as the red velvet ropes came to an end I slipped behind them. I took a few steps back toward the hall and waited for her amongst a throng of photographers. As I stood behind the velvet ropes and looked for Kim I could hear the celebrities speaking to each other. Contrary to what one might think, they sound just like us. As star after star emerged and bulbs flashed I noticed a tight knot of people making their way through the crowd. There in the middle of the pack, surrounded by his team, was the man himself, ninety-five year old Bob Hope. He couldn’t walk un-assisted but he was not in a walker. He carried no cane and the sight of such a legend in a wheelchair just does not have the same panache. For the purpose of this red carpet, he walked aided. On either side of him and each holding him up by one arm were two strapping young men who were hale and hearty, fit and handsome. I don’t know if they were his grandchildren, great-grandchildren or just individuals hired for that purpose but they were great at it. He was able to exit that ballroom on his own two feet (plus four others). The picture was nearly complete. 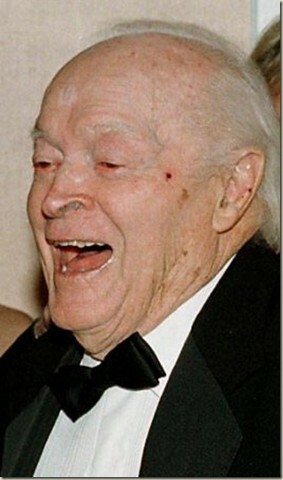 Except… it seemed the Bob Hope we all knew and loved was gone. He was still breathing and semi-walking but the body was giving out and showing signs of its nine decades on earth. His trademark smile was more of a droop at the edges and he looked a bit forlorn and tired after such a long evening. As his handlers escorted him from the ballroom I could hear Dolores speaking into his ear as they walked and her words were inspiring. This is what she said. And with that, the man who sang and danced and told jokes in every medium on every continent for most of a century came to life. His posture straightened, his head came up, and right there, on facial bones you could almost feel and skin so thin you could see his capillaries was the biggest Bob Hope smile you’ve ever seen. The transformation was amazing and with every step he seemed to grow more sprightly. The red carpet was about fifteen or twenty feet long and then it was off to our cars or waiting limousines and the photographers would re-focus on the next big star to emerge from the room. But for those fifteen or twenty feet, when it really mattered, the ninety-five year old veteran of show business was himself once again. Later as I sat and thought about that night I realized that being close to cameras and celebrities can sometimes have a voyeuristic appeal. I also understood that whatever we tell ourselves or our children or husbands or wives about that moment is probably okay. Lourdes Leon is in college now and I’m sure she can distinguish between a rabbit and a photographer. She seems like a lovely young woman. Bob has left us a ton of memories and I am grateful for all of them. Whether it is about “bunnies” or the “big moment” it is just part of a process that feeds our inherent desire to see photographs of the people we admire or loathe or simply can’t stop looking at. If I’m too old to smile naturally when it counts, then I hope someone is there to whisper in my ear too. Wonderful story of a beautiful memory! Thank you for sharing it! A very special look into the true essence of 3 extraordinary celebrities. The sweetness of a tender mother turning a frightening experience into a comforting moment for her child, the life loving spirit of an elderly veteran performer and the kind generosity of a terrific human being who made it all possible for you to witness are very heart warming accounts!